Description: John Fitzgerald Kennedy, the 35th President of the United States, was assassinated at 12:30 p.m. Central Standard Time (18:30 UTC) on Friday, November 22, 1963, in Dealey Plaza, Dallas, Texas. Although the Commission's conclusions were initially supported by a majority of the American public, polls conducted between 1966 and 2003 found that as many as 80 percent of Americans have suspected that there was a plot or cover-up. A 1998 CBS News poll showed that 76% of Americans believed Kennedy had been killed as the result of a conspiracy. A 2013 AP poll showed that, although the percentage had fallen, more than 59% of those polled still believed that more than one person was involved in the President's murder. A Gallup Poll in mid-November 2013 showed 61% believed in a conspiracy and 30% thought Oswald did it alone. In contrast to the conclusions of the Warren Commission, the United States House Select Committee on Assassinations (HSCA) concluded in 1978 that Kennedy was probably assassinated as a result of a conspiracy. The HSCA found the original FBI investigation and the Warren Commission Report to be seriously flawed. While agreeing with the Commission that Oswald fired all the shots which caused the wounds to Kennedy and Connally, the HSCA stated that there were at least four shots fired (only three of which could be linked to Oswald) and that there was "...a high probability that two gunmen fired at [the] President." The HSCA did not identify any other person or group involved in the assassination besides Oswald, but they did specifically say the CIA, the Soviet Union, organized crime, and several other groups were not involved, although they could not rule out the involvement of individual members of those groups. Kennedy's assassination is still the subject of widespread debate and has spawned numerous conspiracy theories and alternative scenarios. 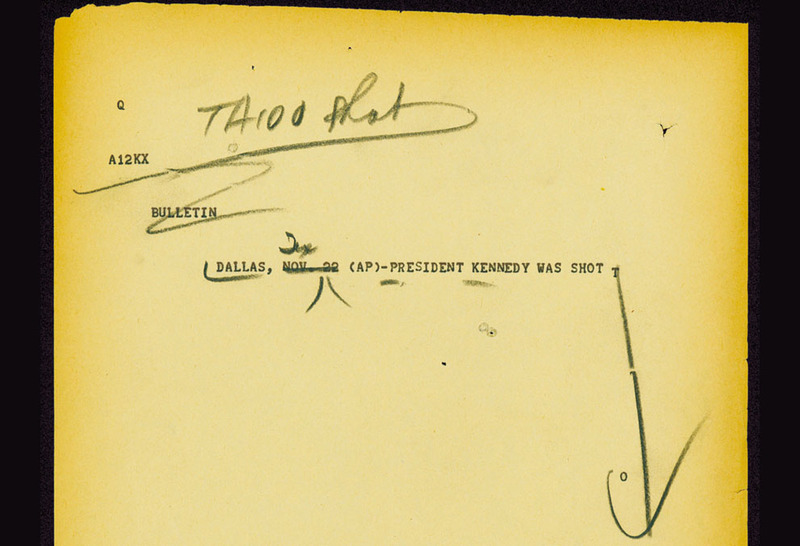 Copies of the AP wire as the news about the JFK Assassination unfolded. The Texas School Book Depository (now the Dallas County Administration Building) is the former name of a seven-floor building facing Dealey Plaza in Dallas, Texas (U.S.). Located on the northwest corner of Elm and North Houston Streets.